In the 21st century, industrialized countries and its people enjoy all the advantages of access to stable electric energy supply, facilitating everyday life. Electricity has converted many pre-industrial economies and societies into highly industrialized, mechanized and increasingly automated countries. It is difficult for most people to imagine what life without electricity would actually mean for them. Yet, still more than 1/7 of our world’s population does not enjoy this precious privilege. While some countries are still lagging behind in providing their citizens with stable access to electric power, other nations have made great progress: by the end of 2015, China attained 100% electrification of all 455+ million households for 1.376+ billion citizens respectively. Enormous progresses have also been made in Bangladesh, not least thanks to the work of Dipal Barua who masterminded an innovative and highly successful financial mechanism that has helped to bring sustainable solar power and light to millions of rural poor in Bangladesh. 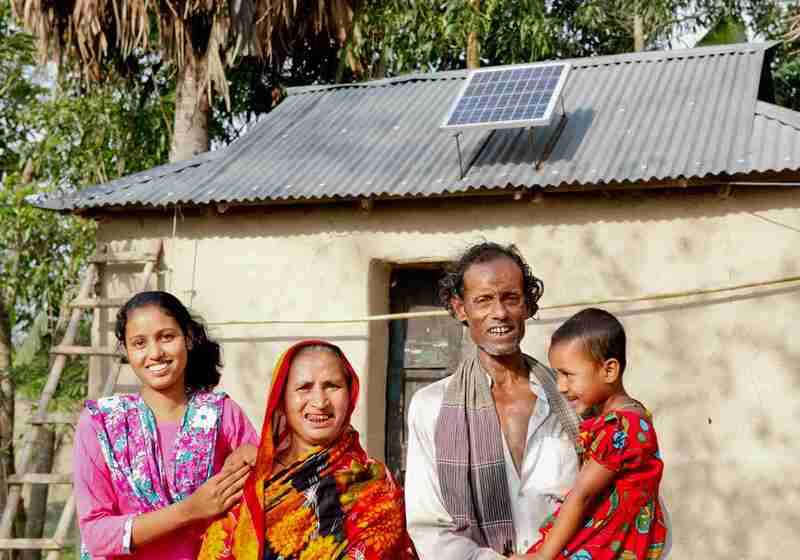 In a recent interview with Sinovoltaics, Dipal Barua spoke about his work at Bright Green Energy Foundation (BGEF), the past, present and future of solar rural electrification and his vision of Bangladesh becoming the world’s first solar nation. Dipal Barua is an internationally renowned pioneer and leading expert in Renewable Energy, especially solar in off-grid rural areas. As Co-Founder and Deputy Managing Director of Nobel Peace Prize-winning microfinance organization Grameen Bank and Founding Managing Director of the Right Livelihood Award-winning clean and renewable energy Grameen Shakti, he spearheaded a market-based renewable energy finance model that has brought sustainable solar power, and thus light and improved livelihood, to millions of rural households in energy-starved Bangladesh. For his work and accomplishments he has been awarded with numerous prizes and awards in the field of clean and renewable energy, including the European Solar Prize (2006), the Ashden Outstanding Achievement Award (2007) and the highly prestigious Zayed Future Energy Price (2009). 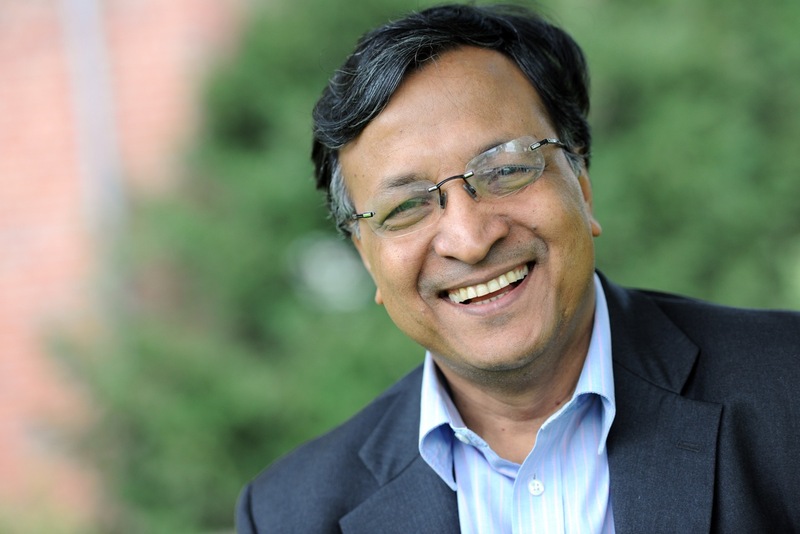 Dipal Barua is currently Chairman of the Bright Green Energy Foundation which he founded in 2010 and which is one of the leading solar and renewable energy organizations to provide renewable energy solutions to the rural poor of Bangladesh. He is also Councilor of the World Future Council (WFC) and President of the Bangladesh Solar & Renewable Energy Association (BSREA). SINOVOLTAICS: First of all, I would like to thank you for making this interview possible. Dipal Barua: You are welcome, Niclas. It is a great pleasure to speak with you again. SINOVOLTAICS: Thank you Dipal. It is actually quite a challenge to put you and your work into only a few words. Could you please briefly introduce yourself to our readers? Dipal Barua: Of course. 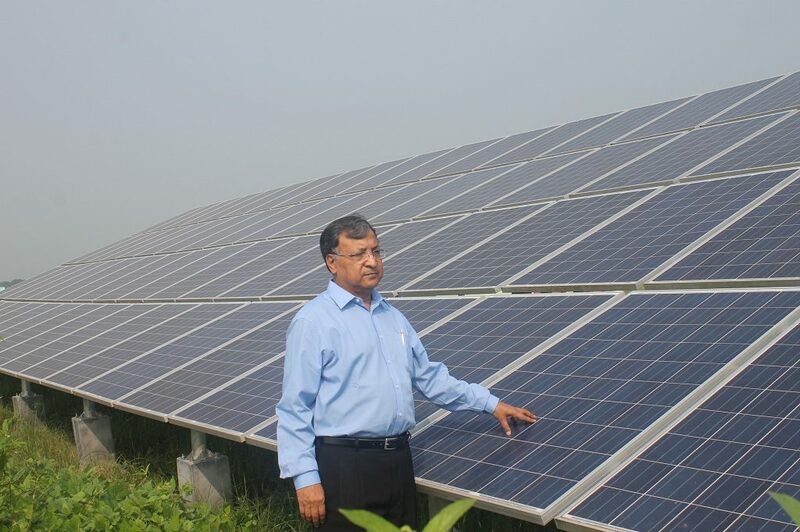 I am Dipal Chandra Barua and I have been running for over 35 years in renewable energy, innovative financing and rural electrification for sustainable development of Bangladesh. I was Co-Founder and Deputy Managing Director of Nobel winning Grameen Bank and Founding Managing Director of Grameen Shakti, positions in which Ihad worked for many decades and during which I had designed and implemented a monthly installment based financial model at the price of kerosene back in 1996 which has brought clean and renewable energy systems to millions of poor rural people in my country. This model has been very successful and adapted by many international organizations. World Bank has made it a role model for renewable energy-based electrification. After I received the Zayed Future Energy Prize in 2009 as the first recipient ever, I founded Bright Green Energy Foundation (BGEF) to focus exclusively on the improvement of people’s livelihood by providing renewable energy solutions for clean and stable access to power at an affordable price. SINOVOLTAICS: How did you develop your famous renewable energy microcredit model and how does it actually work? Dipal Barua: I am really proud to say that Grameen Bank started in my own village Jobra (1976), while I was a student in Chittagong University and one of the co-founder of Grameen Bank. 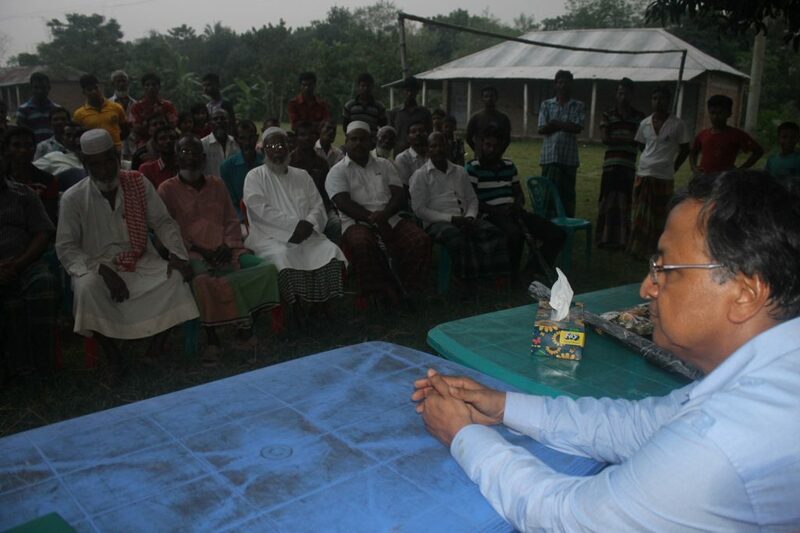 When I was in Grameen Bank, I went to many villages; I actually visited more than 40,000 villages by foot throughout the country. At that time (1996) we didn’t have roads like we have today, so it was not as convenient as it is nowadays… we met many people and everytime when we visited villages, the people started to tell me ‘We don’t have electricity, what can we do about it?’ and ‘How can we have stable and good light here in our village?’. People in Bangladesh use kerosene lamps for lighting, however the problem with kerosene is its fluctuating pricing, so it’s expensive and unpredictable for the people, and its fumes are also polluting, causing serious health problems. And of course, there is the danger of fires. So, I thought, the solution must be to bring the villagers clean and stable energy and this is more cost-effective than kerosene. And this solution centered around solar energy, which is the best and sustainable technology to solve all these problems at once and given the good conditions of our country. Back then when we began first trial projects to introduce solar systems to some villages, costs for a system were at 7USD/ W and since the villagers could not buy the systems on cash, I introduced innovative monthly installment based financial model for our off-grid solar home systems, at the beginning with installment plans over 6 months.The first system was installed in an off-grid village in Tangail District. Before installing this solar home system, the whole village was in dark. The owner of that particular system was so happy and proud that in the day of installation, he invited of our colleagues for dinner. After we set up the first systems, we soon learned that the others villages went to see the installed systems and witness its benefits: stable and bright light in the village even in the evening. Not only did the villagers of the first trial systems pay back the solar home system loan, but we also received many more enquiries for our solar home systems and gradually build many more systems and installment plans. We went from 6 months to 12 months and so on, so it grew step by step to 24 months. The extended installment timeframes helped to bring down costs, including monthly installment reductions, and made our solar home systems more and more popular. Also, improvements in solar technology helped us in designing better and more efficient systems. This is how our field-proven solar home system innovative monthly installment based financial model gradually developed. Basically, you need a financial mechanism that allows people to buy, trade and own, secondly you need a good technology that works and functions and thirdly you need social acceptance for the model to work. BGEF-supplied and installed Solar Home System (SHS) on the rooftop of a house in rural Bangladesh. SINOVOLTAICS: So, after your first trials, demand for your solar home system soon exploded… how many systems did you install per month back then? Dipal Barua: Well, it took many years for the whole model to fully unfold. In the beginning, we only installed 10,000 solar home systems in a time frame of about 10 years. Then, it rapidlygrew to 1000 systems per month and more. When demand for our solar home systems started to climb steeply, we even reached over 500,000installations within one year. SINOVOLTAICS: How many systems have since then been installed? Dipal Barua: More than 4.5 million solar home systems have been installed, benefiting over 25 million people. SINOVOLTAICS: The statistics are definitely incredible, and nowadays millions of households benefit from your solar home systems, not least thanks to the microcredit scheme. With all this success, why did you decide to go your own path after having been in charge at Grameen Shakti for so many years? Dipal Barua: For many years I was the Managing Director of Grameen Shakti, also at the same time I was the Deputy Managing Director at Grameen Bank, which kept me very busy, brought me to many conferences. But, when I was awarded the first Zayed Future Energy Prize in 2009, I felt deeply honored and thought I had to focus on renewable energy only. As a consequence, I set up a Scholarship Fund with the Zayed Future Energy Prize award money to expand and create 100,000 Green Energy Women Entrepreneurs and established Bright Green Energy Foundation in 2010. At Bright Green Energy Foundation, I am now more flexible and have more time to fully focus on renewable energy and develop solutions for the improvement of the livelihood of the people. I can now 100% engage myselfin renewable energy, especially solar. SINOVOLTAICS: Please tell us more about your new Bright Green Energy Foundation and your current programs. Dipal Barua: Bright Green Energy Foundation has 304 rural branch offices in 52 districts in Bangladesh and over 1200 skilled and trained employees. Our foundation focuses on the improvement of people’s livelihood by providing cost-efficient renewable energy solutions for clean and stable access to electric power. Simply spoken, we would like to bring the livelihood of a city into the rural areas. Our focus is therefore on renewable energy technologies only. Our programs involve improved cooking stoves that provide for clean, economic and health cooking, then we have bio gas plants that basically utilize cow dung to generate bio gas that can be stored and used for cooking, and of course solar home systems from 20W to 85W which are our main focus.We are also installing Solar Irrigation Pump (SIP) to provide irrigation water for agricultural sector. 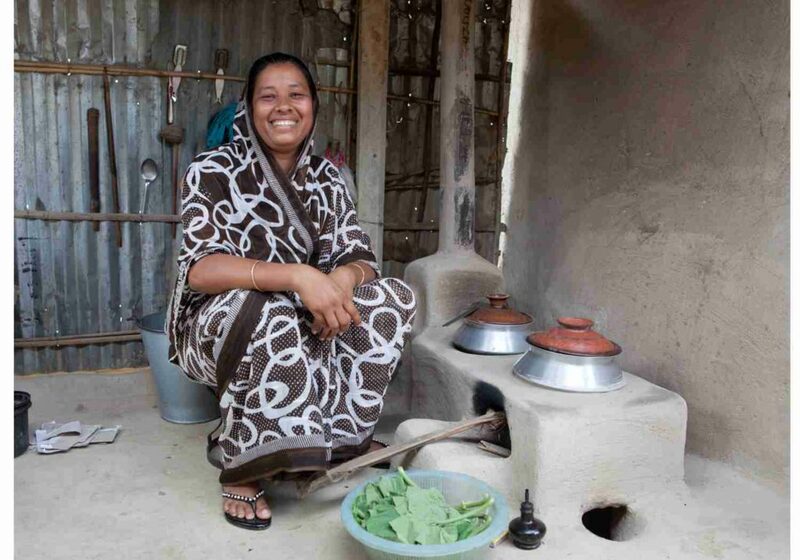 One of BGEF’s Improved cook stove (ICS) in action. SINOVOLTAICS: How many solar home systems do you install in a month? Dipal Barua: Through BGEF, we have so far installed over 150,000 systems and currently installing about 1500 solar home systems in a month. Few years ago, we installed over 5000 solar home system installations in each month. However, the market is now increasingly saturated and I think full saturation will be achieved by 2020/ 2021. As I have mentioned, we have now over 4.5 million installed solar home systems and I expect this number to increase to 7 million systems within the coming 5 years. SINOVOLTAICS: What further plans do you have once saturation is reached? Dipal Barua: The livelihood of many rural people has improved a lot, and after mostly having bought small systems for simple lighting applications and mobile charging, there is a growing demand now for bigger systems. People in the villages have higher requirements and Bright Green Energy Foundation will design and provide larger systems to meet these demands. And, thanks to the decrease prizing for solar energy and to technologies such as LED, efficiency-cost ratio of our systems has also improved a lot. SINOVOLTAICS: How can poor people in Bangladesh’s villages afford a solar home system? What is the average income of the people you are selling to? Dipal Barua: Many rural buyers’ income level is around 8000 Bangladeshi Taka, which is around 100 US Dollars. This is low income, so the majority of them buy 20W – 30W solar home systems for lighting and mobile phone charging. Such small systems cost around 125 US Dollars for which we offer plans with 15% down payment and 36 installments, and for such a smaller system their monthly payback is between 3 to 4 US Dollars. With the solar home system microcredit, everybody can buy it. SINOVOLTAICS: Do you design the solar home systems yourself or do you use pre-designed system kit solutions? Dipal Barua: We have our own system designs and engineers that configure these, and then we import components from various parts of the world, including inverters from Europe and solar panels from Asia. Our team then puts the components together to kits. SINOVOLTAICS: Your solar home systems are obviously all off-grid systems? How about on-grid systems in Bangladesh? Dipal Barua: Yes, our solar home systems are all off-grid, but we are also now offering on-grid solutions which are also supported by the government. Actually, our office here is powered by an on-grid tied 3kW system. To further boost solar in our country, the government is currently drafting an FIT policy scheme for Bangladesh on which I am also participating as advisor. SINOVOLTAICS: In which way do individual rural poor users benefit from your programs? Can you cite an example of how solar home systems changed the life of your customers? Dipal Barua: There are many examples, and the ones I am most proud of, involve the empowerment of rural women, basically by providing them with technical skills and education so that they can further improve their livelihoods and those of their families. So, we have Green Technology Centers (GTC) in different districts in which we train rural women to solar technicians so that they can maintain and repair their solar home systems or those of other households. This means they are part time housewives and take care of their families, but on the other hand they also do solar energy as part time job. We have trained so far more than 5000 technicians, most of them are women, and due to this training, many women utilized their technical skills found jobs in charge controller and LED assembling factories in Bangladesh, in which their knowledge about these components has been very essential. In fact, most of the workers in those factories are women, many of which were trained before in our Green Technology Centers (GTC). Basically, we train rural technicians, mostly women and including young students, boys and girls, to repair solar home systems. Every month, we organize regular training sessions as well as customer trainings. And most of them are women. SINOVOLTAICS: Recently, BGEF started to offer solar-powered irrigation systems: could you please tell more about this and who are the primary customers of such systems? 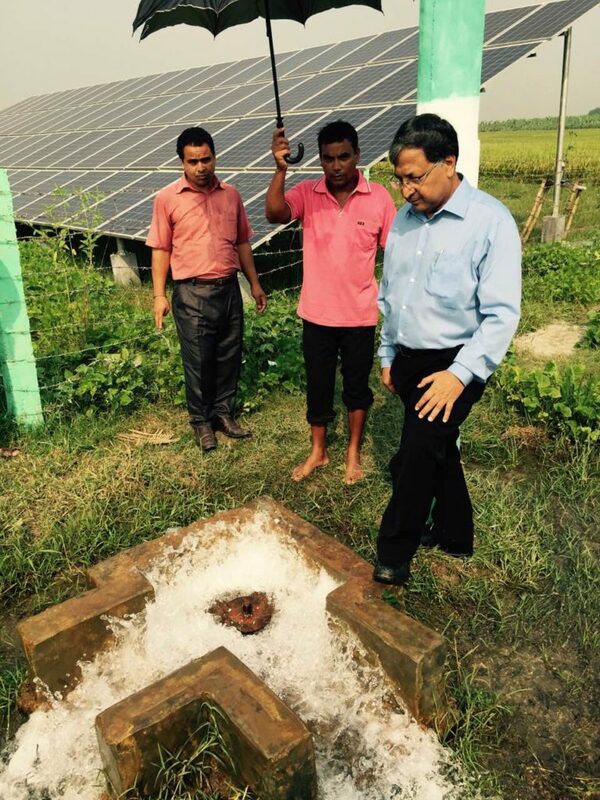 Dipal Barua: BGEF has installed 16 solar Irrigation Pump (SIP) so far with total capacity of each minimum 20kW and which are used for cultivation of about 25/30 acre of land. So, the farmers can now better plan and plant more and different crops. We also engage agriculturalists to introduce new crops and working all together with the farmers to provide them with new crop solutions, such as rice and bananas. After internal research and trials, we introduced solar water pumps that pump underground water and through a refining process provide clean drinking water by filtering the arsenide contained in that water. Our first solar powered arsenic treatment plantis in the setting up process at a school, so that the children can now drink clean fresh water. Dipal Barua: Yes, the concept of our ECO-Villages is basically a mini DC grid system with storage, connecting different solar households. Our idea is to first try it on the house-level and then gradually expand the DC grid and connect all the houses. It’s an ownership-centered model. From my experience in Bangladesh, everybody wants flexibility, independence, so a DC grid is helpful in this regard. SINOVOLTAICS: What is the biggest challenge at the moment running Bright Green Energy Foundation? Dipal Barua: There are many challenges. First of all, we have lots of competition in Bangladesh. There are more than 60 NGOs here offering similar products through a similar programs, so what we need is innovation. Competition is good to keep pushing for innovation. We look at broadening and expanding our activities, doing any kind of livelihood improvement using renewable energy. With the growing saturation with small solar home systems, one direction is of course the increasing demands of villagers for solar home systems with higher capacities, such as 300W systems. Demands of previous years for lighting and mobile phone charging have grown to color TVs and fans. New programs involve the solar irrigation systems which we just discussed about and which have far less competition, and we also look at working on larger power projects, rooftop installations and water distribution, to improve food and drinking water security. We are working now with different schools to develop solutions for electricity and drinking water supply. We continuously research on new renewable energy programs and once a program has proven to work well, we will do more of it, multiply it and implement it nationwide. Dipal Barua: Yes you are correct. See, as our programs work in Bangladesh, why not in other parts of the world? We would definitely like to explore possibilities in other countries, for example in our neighboring country Myanmar. But, we need to understand the market and local conditions, because we want to do it well and become successful by taking clean energy to rural household. SINOVOLTAICS: How do you see solar and rural electrification in Bangladesh in the next 2 to 3 years? Dipal Barua: I have a very ambitious dream. Bangladesh receives lots of sunshine every day which has so much potential. My dream is that Bangladesh becomes the world’s first solar nation by 2020, with solar energy on every house. Not only solar home systems for rural households, but also for urban and township areas, so that the whole country is covered and powered by solar to benefit its people with clean renewable energy. SINOVOLTAICS: As a last question: you have just recently been re-elected President of the Bangladesh Solar & Renewable Energy Association – my congratulations. What does this association do to support solar energy in your country? Dipal Barua: Thank you Niclas. Yes, I was elected as the president of Bangladesh Solar & Renewable Energy Association (BSREA) for the third term. BSREA is a business association that was established in 2011 and is member of Bangladesh’s Ministry of Commerce. Our association consists of currently 54 company members that are all engaged in renewable energy or energy efficiency. In the past five years we organized many conferences to discuss policies and schemes to create an environment for solar energy in our country, including financing for sustainable development and tax reductions to support business development. BSREA tries to develop a growth map for Bangladesh and we work also together with the national energy authority and officials from other government departments to promote energy efficiency and renewable energy.Our government has declared to reach 100% electrification in Bangladesh by 2021 and we say: solar energy has to grow also like this. SINOVOLTAICS: Definitely and we wish you very much success in this ambitious undertaking! Regards to Dhaka and see you soon again. Dipal Barua: Thank you very much and see you soon again.